The power of market forces. The way to make market forces work in our energy sector is to set the carbon intensity of electricity generation and then let the technologies compete to be the most carbon and price efficient. An amendment to the Energy Bill, if successful, will set the carbon intensity at 50g of carbon dioxide per kilo watt hour generated by 2030. This is an opportunity to write to your MP to urge them to support the amendment and make a difference. Investors are starting to size up making money out of unconventional gas in your community: The Fleet Street Letter – Saudis to quit oil business? As they say themselves corporations are only interested in one thing – making money. Forget about the environment. Not only do they not care about the environment, which sustains us, but it is probably a very bad investment anyway according to the report Unburnable Carbon 2013: Wasted capital and stranded assets by Carbon Tracker Initiative and the London School of Economics. The Government’s unconventional gas policy is a train crash in the the making when considered in relation to climate change, the local and global environment and the fossil fuel industry’s assets. Even the Civil Servants are resigning. The House of Commons Energy and Climate Change Committee’s 7th report The Impact of Shale Gas on Energy Markets has finally been published and has provoked a welter of headlines such as ‘Get on and drill’ for shale gas say MPs , but the report is far more measured. The report basically says that the situation in the UK is not the same as the US, that gas prices probably won’t come down and may go up, that communities need bribing, questions tax breaks for the drilling companies, says we need CCS, says shale gas in the US has resulted in higher emissions due to displaced US coal and that it is incompatible with our climate change commitments. This report provides little clarity as most of its recommendations are very serious caveats to the premiss that shale gas is a good idea. Further, two of the committee members, including the chairman, have tabled an amendment to the Energy Bill to set in law a carbon intensity of 50g/kWh, which is a serious statement about greenhouse gas emissions. This is entirely incompatible with burning all of the known oil and gas reserves, let alone the unconventional gas. On 11th March 2013 the government launched the Office of Unconventional Gas and Oil (OUGO), it is understood that both UK Methane Ltd and the Tyndall Centre for Climate Change Research were present. On 14th March 2013 at the debate in Bath between UK Methane and Frack Free Somerset, UK Methane said that they had recently been at a meeting with Ed Davey, the Minister for Energy and Climate Change, and that they recognised that we need to decarbonise our energy sector and said that unconventional gas could be a transition fuel to help reduce emissions from coal. On the 12th March 2013 Professor Kevin Anderson of the Tyndall Centre for Climate Change Research was unimpressed with the government’s assertion that an unconventional gas industry is compatible with our legal commitment to limit climate change to a 2°C rise this century. “Shale gas is the same as natural gas – it is a high carbon fuel, with around 75% of its mass made of carbon. For the UK and other wealthy nations shale gas cannot be a transition fuel to a low-carbon future – anyone who says differently does not understand our explicit international commitments under the Copenhagen Accord, the Cancun and Camp David Agreements – or, alternatively, is bad at maths”. Today we also hear that the government has ignored planning advice that commercial and residential property should not be built too near UK nuclear plants – Planning advice is ignored over building near nuclear sites. If the government ignores planning advice over nuclear plants then it may pay scant regard over unconventional gas planning. Government and local communities need to get real and start joining up the dots between energy, climate and food security. 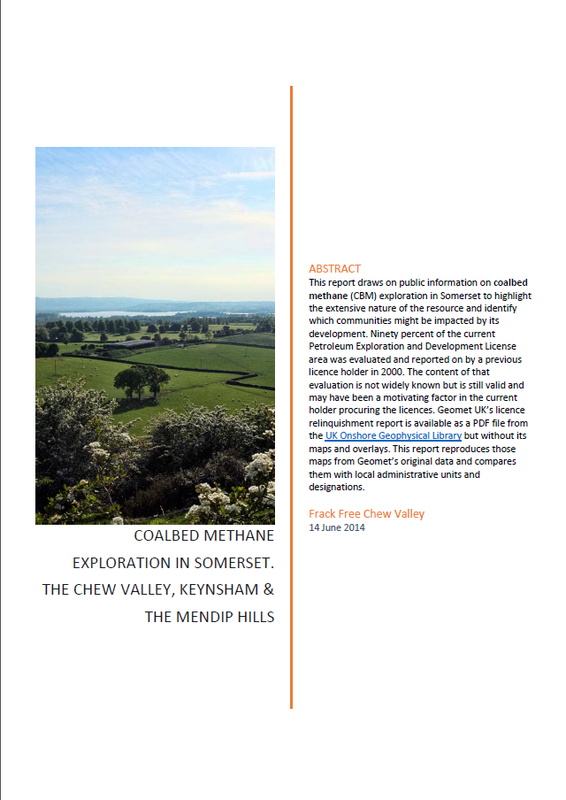 Dr Mariann Lloyd-Smith, an Australian expert on chemicals policy and waste management, will be speaking at a public meeting in Bath on the 13th May 2012 on the potential toxic impacts of coalbed methane – see Frack Free Somerset. Dr Mariann Lloyd-Smith is also spending a morning with local Councillors on the 14th May – see Frack Free Somerset. Check out the two new videos on the site, including an animation of the fracking process for shale gas and a lecture on potential toxicity problems associated with coalbed methane in Australia by Dr Mariann Lloyd-Smith – who will be speaking at a Frack Free Somerset event coming up soon – see next post. The British Geological Survey is expected to release its revised estimate of unconventional gas resources in the UK any time now. Elements of the press and some politicians continue to speculate what these figures might be, rather than wait for the figures to be published. Recent press estimates range from “Shale gas could heat all homes for 100 years” (The Telegraph 6th April, 2013 – by Louise Gray) to “Britain has shale gas for 1,500 years, but bills won’t be lower” (The Times, Feb 9th, 2013 – by Dominic Lawson). Only a portion of the gas in the ground is technically recoverable, perhaps between 10% and 20%. Only a portion of what is technically recoverable will be economically recoverable – no one currently knows how much. In the South West 26% of households are not on the mains gas network, including entire villages in the Chew Valley. These households use other energy sources including bio-fuels such as wood, and fossil fuels such as oil, propane and liquid natural gas (methane). Some households use no fossil fuels for either heating or electricity. Commenting on another article by Dominic Lawson on climate change in the Independent newspaper, Professor MacKay has noted that “irresponsible journalism like Dominic Lawson’s deserves a good flushing”.